Who doesn’t love a biscuit (or two) occasionally. 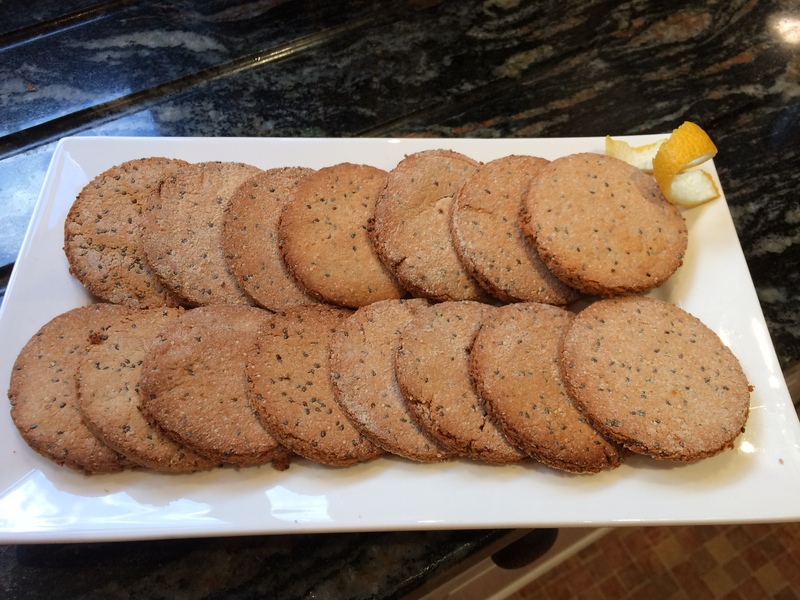 These Lemon, Coconut and Chia Seed biscuits are a very tasty item to find in the biscuit tin and are quite simple to make. The chia seeds give a delicious little ‘crunch’ and the lemon flavour really comes through making them quite the perfect addition to a cup of coffee or pot of tea. I creamed my butter and sugar in a Nutribullet and then added the juice, extract and eggs blitzing very quickly before pouring on to the dry ingredients. Worked well. Lightly grease two baking sheets with coconut oil. Mix the almond flour, coconut flour, baking powder, chia seeds and sea salt together in a large bowl. In a blender, mix the coconut butter and coconut sugar together until creamed (not crumbly). Add the lemon zest and juice and the vanilla extract. Mix in the eggs gradually. Fold the wet mixture into the dry flours until combined, being careful to not over-mix it. Roll the biscuit dough out on a lightly floured surface, to about 5mm thick. Cut out approximately 25 – 30 circles, re-rolling the dough as necessary. Put the biscuits on the baking sheets and bake for 10 to 12 minutes until golden brown and crisp around the edges. Remove from the oven and leave to cool completely before storing in an airtight container. Makes approximately 25 to 30 biscuits. This entry was posted in Sweets and Treats and tagged Almond Flour, Biscuits, Coconut butter, coconut flour, Egg, Gluten Free, Healthy Eating, Lemon, Wheat-Free. Bookmark the permalink.